Uttar Pradesh Subordinate Services Selection Commission (UPSSSC) is going to conduct written test for the posts of Junior Engineer / Avar Abhiyanta posts. The written exam is scheduled to be held on 31 July 2016. Earlier Uttar Pradesh Subordinate Services Selection Commission had completed the process of getting applications for these posts. The test will be held at lucknow centers and in two sessions i.e. morning & evening session. 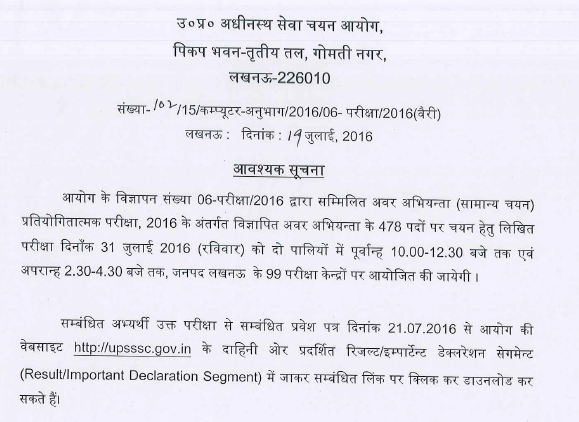 The Admit card of UPSSSC JE will be released on 21 July 2016. Those candidates who had applied successfully, can download UPSSSC JE Exam Admit card from the direct link given below around the date above. 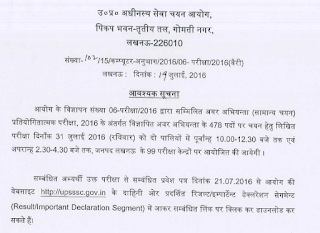 Uttar Pradesh Subordinate Services Selection Commission is going to conduct written exam on 31 July 2016 (from 10:00 am to 12:30 pm and 02:30 pm to 04:30 pm) for Junior Engineer / Avar Abhiyanta posts. For that, admit card had been released now. Candidates have to download UPSSSC JE admit cards from the official website upsssc.gov.in via the direct link given below. The test will be held at various centres in two sessions. All the important details like roll number, date and time, venue of exam etc. had been mentioned in the hall tickets. Earlier Uttar Pradesh Subordinate Services Selection Commission had invited applications for written Examination for JE posts as per advt 06-exam/2016. 31.07.2016 - from 10:00 to 12:30 pm morning session and 02:30 pm to 04:30 pm. No. of exam centres: 99 in Lucknow. The written examination consists of two papers of multiple choice objective type. There shall be two paper in written test carrying a total of 750 marks. Interview will be of 250 marks. Questions will be asked from Hindi, Engineering, GK, Computer Knowledge, Gen. Intelligence, English subjects. In order to download the admit card for UPSSSC sammilit avar abhiyanta / Manchitrak (Manchitrakar) / anay takniki pad exam, candidates need to visit the direct link provided here (after release). It will take you directly to download page. Then candidates need to enter their registration details and click submit. Their UPSSSC JE Admit card 2016 can be downloaded after that. The admit card is available from on 21 July 2016.